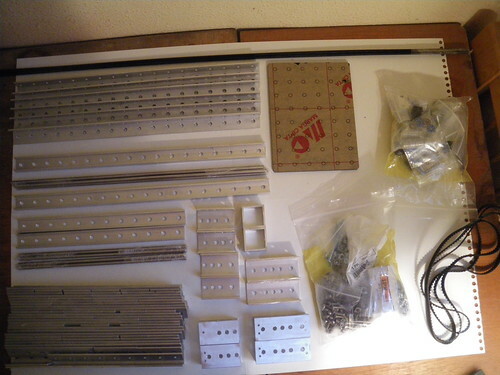 Forum » Contraptor Forum / Questions / Issues » Mini-CNC Build log. Day by day build log for my all new contraptor mini-cnc, will try documenting and hope it helps. I just received my mini-cnc subset ( thanks a lot ! ), and I'll try logging thing here as I build it. Here = Spain, so it took like a week to ship. It came as two shipments, a tube for the long parts and a box for the rest. Nothing's missing, and everything is shinny and looks very cool. 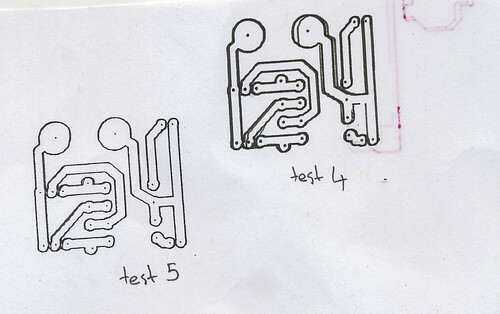 So then I went online to http://www.contraptor.org/mini-cnc-subset, and started following instructions. For each part type I assembled, I recorded the last one I assembled and put it on Youtube. The assembly of the components was very easy, very fun, and took less long than I expected. The only difficulty was with the Coupling nut clamp, the notches were not deep enough so I had to make them deeper, did not have the right tools, cut myself, but now it all fits good. So now I'm in no-documentation territory, the real fun begins. Well that's not completely true, there are lots of good pictures of the different steps, that should count as documentation. 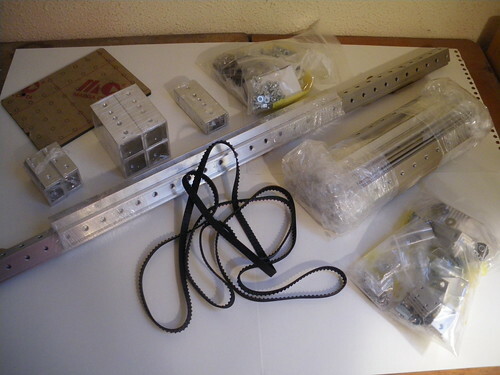 Today I assembled/filmed the assembly of the base, the y-axis rail, and the x-axis rail and wagon. Nothing much to be noted, except that you really really want to follow the instructions right. On day one for the linear bearing elements, I did not follow the part where you have to exactly ajust to 1/8", and today it caused me a lot of trouble when making the x-axis. Assembly of the base subassembly, made 3 videos, one for the back, one for the front, and one for joining them. Bad surprise today, flickr does not want more pictures, have to wait until next month … so no pictures. Everytime I post a video, Albanetc checks it and give me tons of precisions and cool advices, it helps a lot. I try getting the more of that as I can into the video annotations. OSH things rock ! 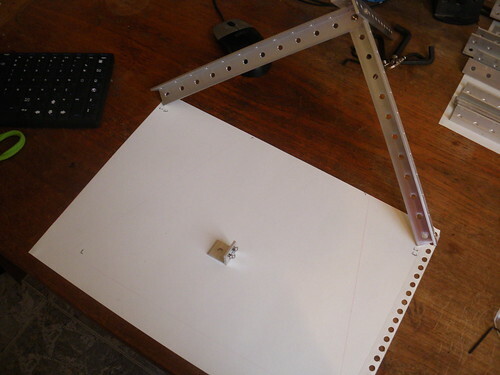 So today I attached the Y-axis to the base, and made the Z-axis. Just following the pictures, simple, a few things to figure out, but nothing hard. Will make more when have time. The videos are nice, looking forward for more..
Also want to see how the Pololu drivers will work with these motors as Reprap drivers are pretty expensive and only provide half-stepping. However, they are through-hole and put out 2.1A. If Pololu could be used instead, it would make the electronics a lot cheaper and would help with vibration. Did not even notice the camera had a screw-thing, updated my stand, much better now. I have worked with the pololu drivers once before, and going from half stepping to 16 steps micropstepping is like night and day : very smooth movement, nicer noise, more precision, increased torque, much less vibration … They are very good drivers, sole problem is they are not OSH. I like the videos, they are really the best way to show the assembly process. I remember doing Contraptor video examples - it takes time to shoot and edit them - and I was somewhat hesitant to make them before I had all the details nailed down because if something would change later, I would have to re-do one or more videos. I think assembling contraptions is different. The mini CNC design in Sketchup at Google 3D Warehouse has already deviated from the first version (which was the blueprint in the Flickr set that you're following) and I'm sure there will be changes down the road by different people. I think ongoing improvements and modifications are intrinsic to building machines with Contraptor, and so people will build a mini CNC following your videos and then start branching with their own mods and improvements. Regarding the stepper drivers - I'm currently talking to Jose from Avayan.com, he has an open source design for a stepper driver using DRV8811 chip with microstepping and up to 2.5A rating (http://www.avayanelectronics.com/Products/MDL-STPR1/mdl-stpr1.html). With Reprap stepper drivers (v1.x) and the motors in the E&M subset, I measured the max coil current of 2.1 amps. 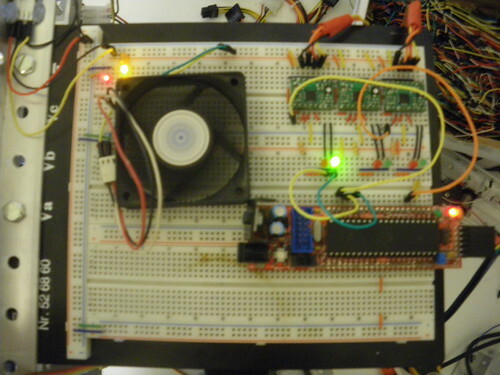 It looks like getting the DRV8811 board to pump continuous 2.5 amps is going to take some major cooling, however the guesstimate is that with just fan cooling, the board might perform as is up to 2 amps. A fan should be a matter of plug and play, since we're already using computer power supply. Of course it needs to be experimentally verified. Today I added the end stops. I had to use cardboard to make them as I lost the plastic angle parts. Also I could not find my nice ribbon wire I used for the steppers, so I used some rigid wire, it's not as pretty but it works. The first one is just a pattern to see if all axes are well aligned, turns out I had to re-do all the Y axis, and adjust the Z axis a little to get the part on the top right right, just finished that. 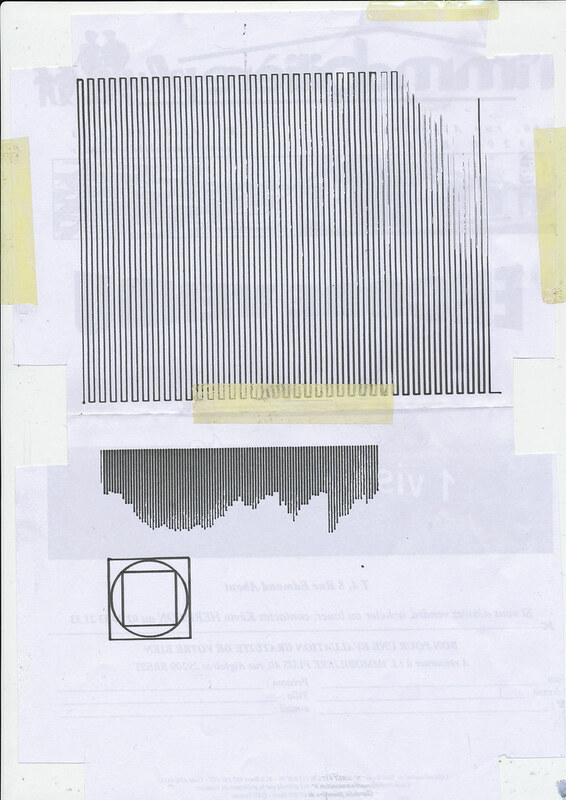 And the last one is my test pattern I use every time I change something on the machine. Nice patterns. I'm wondering how many inscribed circles and squares can be made with a fine pen..
Did the alignment/calibrating grid take long? The pattern at the top is just to check alignment of axes, everything seems ok ( white zones are just due to having two sheets of paper on top of each other ). About alignment also, the circuits at the bottom show the latest problem I'm having : the nut for the Y axis ( also the X but less ) is not well fastened, it has a bit on freedom and moves a bit without the table when changing directions. It's because I changed the threaded rods, and have no well working solution to fasten the new ( metric ) ones, the dimensions don't feet, the screw holes are very damaged, I tried several configurations, hot glue, but everything ends up broken, or with that freedom problem. I hop I fix this soon. That's what I'll look into when I order the aluminium for the bigger machine. 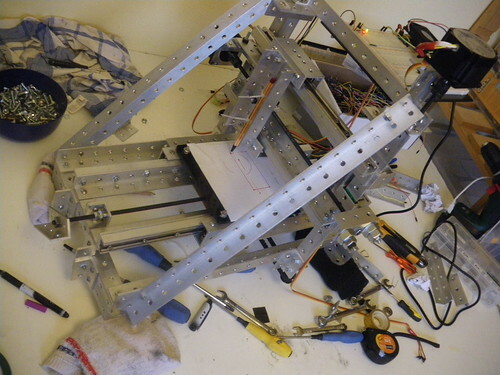 So I've been away a long time, I moved to France and the unfinished mini-cnc stayed in a box until a few days ago. I'll post videos and pictures tomorrow. First tests, it draws circles just fine, makes less noise than I would have expected, is more precise too, still a few angles to adjust to have everything well aligned. I measured speed of 7,5mm/s, I'll add flywheels tomorrow and see if that improves. Looking forward to more pics and videos. Openstructures look interesting, in the same vein as Contraptor. There are a few differences with the model, because I lost parts when moving, and I did mount the Z-axis before attaching the X-axis to it, and have no time to unmount/remount everything. Apart from that structurally it seems good, except the acrylic table is leaning by about a mm ( or is it the X-axis ? ) so that needs ajusting. 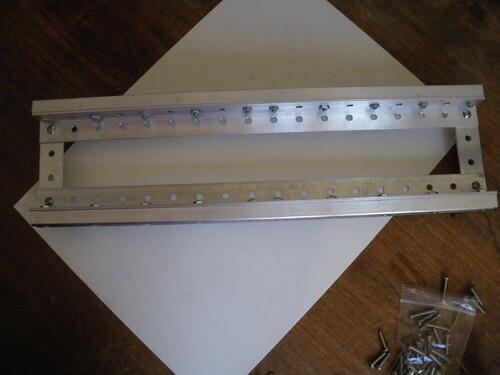 It's not easy to get everything well aligned, to me it seems like the bolts are too thin, when finishing it I used bigger screws ( metric size ) that had just the size of the holes and it made everything way easier. But maybe the small bolt size is needed for some parts to fit ? On the electronics side, I used a sanguino because it's breadboardable, but I don't need the extra i/o. The pololu drivers work great, I think I can't get the best out of them because I must limit speed because my X-axis is a bit hard to turn ( the threaded rod is bent, I may try to replace it for a metric one I have around ), at 500mm/m it blocks, so I need to add current, wich makes more noise, or reduce speed. With the Y-axis only ( wich turns freely ) , I was able to get to 600mm/m ( 23.6in/m ) with nice sound and no problem, but there is only one speed setting for X and Y. The fan ( moved aside for the picture ) is necessary, the drivers get very hot, but it's also sufficent, I did not need to add heatsinks. My main goal is to get it as silent as possible as my gf works in the next room. Putting socks under it works very well for noise reduction but is not really elegent, I will try to find something better. 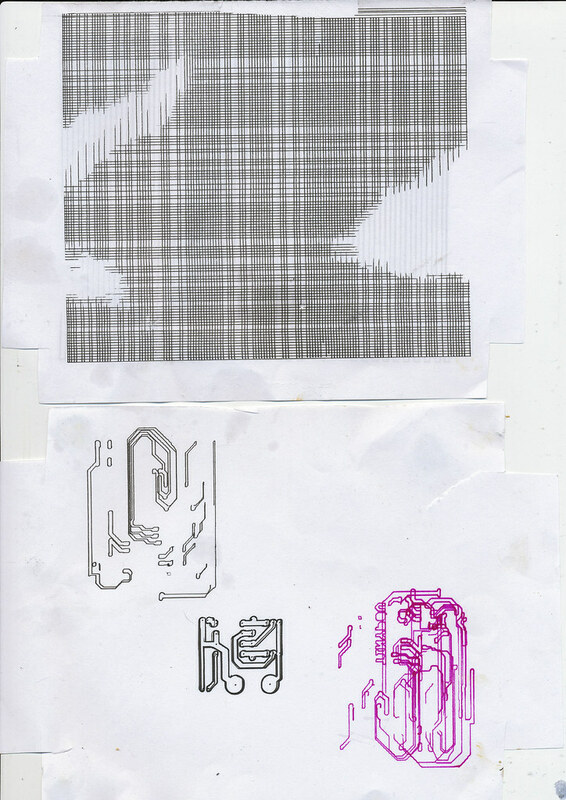 Also, most of the noise comes from the fact that the stepper are tightly bolted to the structure, thus passing vibration, I'm searching for a way to reduce that as well, maybe using plastic/tissue or something, any idea ? First part is with the fast settings, second with the slower but silent ones. Sorry about the quality, not enough light, I will work on that. Looks great, thanks for the visuals! 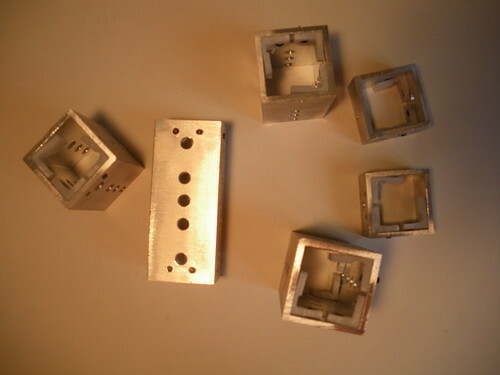 The smaller bolts vs holes are intentional - basically, if everything were to be a perfect fit, the parts would have to be manufactured to high tolerances, and it would be nearly impossible to DIY extra/custom components without precision equipment. Since errors tend to compound, if some hole was just a bit off, it would be difficult to e.g. put a screw through. I've gone through this when the holes were exactly the size of the screws, and at some point I realized that making the holes bigger was the way to go. Alas, the price is that alignment/adjustments must be done at the assembly time, but in the end it works out because, for example, if a rod just won't turn for whatever reason, there would always be some room to adjust the parts relative to each other. 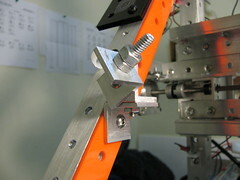 The X-axis can be adjusted to make it parallel with the table. I agree that it's important to get X and Y (and Z - each side) to rotate freely before installing the motor (+belt for Z). On the other hand, I think 15-20 IPM is as fast as it would go using the 1/4-20TPI threaded rods. 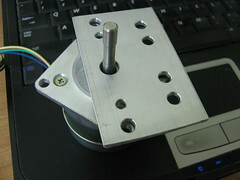 This is 300-400 RPM for a stepper at which point the torque significantly falls. 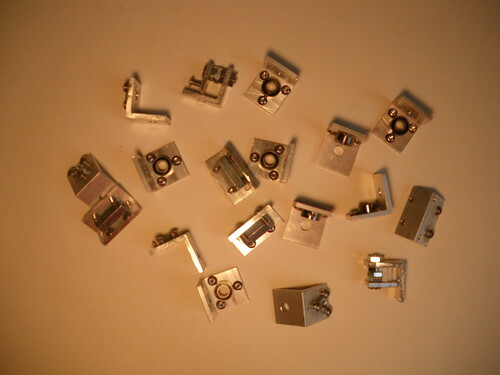 To increase the speed, different lead screws are needed with more travel per revolution. Also - as far as I see, there is no acceleration/ramping in the firmware; in my experience it helps a lot with maintaining accuracy. It seems that at 0:10 in your video the X axis flywheel stops briefly, before continuing to rotate - not sure if it's just the video though, but that likely wouldn't happen with acceleration support. I've been using half-stepping drivers and, from what I'm hearing, noise patterns seem to be similar (http://www.flickr.com/photos/40642599@N07/4101575638/). I think it's characteristic of circles where the motors pass through some resonance points while accelerating/decelerating. I'm wondering if you have any noise on the diagonal moves at different angles. About bolts sizes, the angles in my set were all perfect, but I didn't think of DIY angles, for which the smaller bolts can certainly be a good thing. 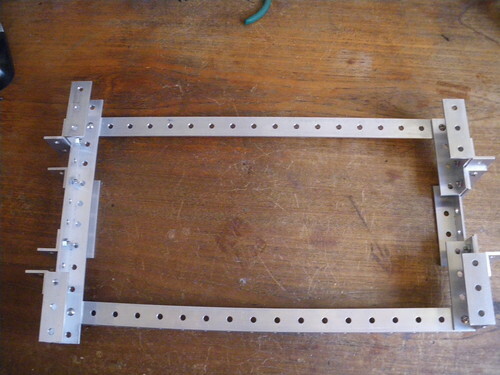 If I were to build it again ( I'll probably do a contrapteur mini-cnc if the project advances ), I'd probably use bigger bolts and just discard/redo/redrill angles/parts that don't fit perfectly. The small bolts in this build were certainly the most annoying thing, and as of now this still causes me trouble ( parts move a bit every time I move the machine ). Both my X-axis and Y-axis got bent when I moved, so that is what was causing most of the trouble you can see in the video. I replaced both with some metric ones I had lying around ( had to adapt/change the bearing and screw parts, but that was not too hard ), and now everything is fine ( except Y axis' stepper moves a mm back and forth when turning, and I don't get where that is coming from, adding more fixation helps, I'll see if I figure it out ). So now they move smoothly, I'll do some speed tests tomorrow. The acceleration is a complete mystery. 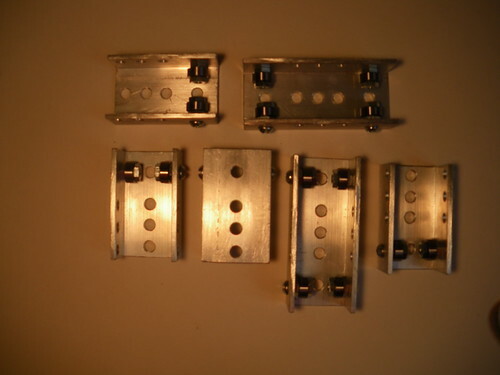 When I had the bent rods, the steppers blocked during acceleration and deceleration at the lower speeds. That's why I set acceleration to 9999999, which is what you see in the video. I'd like to know if the new threaded rods help, but acceleration did not work since I installed them ( circles, that look much like acceleration, work super fine, so that's a good sign ). About noise, I added plastic/rubber parts from my meccano set ( the small black rubber thingies, pics to come ) between the machine and the motor mounts, and between the motor mounts and the steppers, it helped A LOT, the X axis which is the one I have put most work on, can't be heard at 1m distance when at full speed , and does lots less noise in circle/slow speed. I'll do a separate post just for that with pictures of the setup and videos for noise level. The machine ( my girlfriend named it "Andrew" ) is starting to look like something that can be useful, me happy ! Ok, the problem with random acceleration was with MAX_DELTA_V_MM, fixed it, now I can see the problem more clearly. The problem is, when accelerating, at some point it stops working, then when decelerating, it starts working again. Reducing speed/adjusting current gives the following behavior: acceleration -> blocks -> working at full speed -> blocks -> deceleration. Disabling acceleration eliminates the problem : starting at full speed ( MAX_ACCEL_MM 10000 ) makes it work. But I would like to have acceleration working, any idea where does this come from ? Interesting observation about the bolt vs hole sizes. I agree that it would make assembly faster and easier as there would be no need to align anything. And yes, this could be tested by using larger screws for key connections. 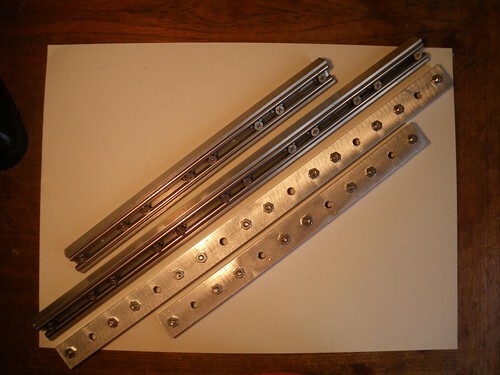 Ideally, the hole size should be 3/16" - 10-24 screws are more compact and inexpensive than 1/4". I'm somewhat skeptical that everything would fit perfectly. However, this is from my experience with manually made parts so of course.. The machine sounds a lot quieter with all these enhancements.